You are driving your car and suddenly the message “Tire Pressure Sensor fault” appears on your instrument cluster. But, What does it mean and how expensive will it be to fix it? Will it be gone after inflating my tires to the correct air pressure? There are a lot of possible questions about this but do not worry. In this article, you will learn what it means and how you can fix it in the fastest and the best way. What does “Tire Pressure Sensor Fault” mean? The “Tire Pressure Sensor fault” message is displaying when there is an error code in your TPMS (Tire pressure monitoring system). The error code may tell you that there is too low or high air pressure in the tires or a defective tire pressure sensor. It could also be caused by a faulty TPMS control unit, Faulty wirings or the TPMS has to reset. The easiest way to find out is to read the trouble codes from your TPMS control unit with an OBD2 scanner. When you see the tire pressure sensor fault-message on your dashboard, I would recommend you to make sure the tire pressure is correct in all tires and then Reset the TPMS system and drive for a while to see if the message is disappearing. You can also scan the TPMS control unit and read the trouble codes with a scanner. The most cheaper OBD2 scanners can only read the engine control unit. If you want to get an OBD2 reader that can read your TPMS system you have to check for a bit more expensive OBD2 scanners that are compatible with your car. How does a TPMS system work? A TPMS system can work in two different ways. 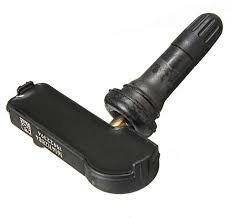 If you have a car after 2007, you will most likely have your car equipped with a TPMS system. Some vehicles have sensors inside each tire on your vehicle. The sensors are feeling what tire pressure you have and send that information to your TPMS control unit. If the tire pressure is too high or too low or the control unit can’t communicate with your sensors, the “Tire Pressure Sensor Fault” message will occur on your dashboard. Other cars do not have sensors in the tires, and they use the ABS sensors to calculate the rotation of your wheel. If you have low pressure, the diameter of the wheel will become more depressed and have to rotate faster to obtain the same speed as the vehicle. If the rate on one wheel is different than the other wheels, the car will store it as an error code in your TPMS or ABS system. That is why you have to drive for a distance before the car shows the tire pressure for you. It is just a calculation and not the exact tire pressure. How to fix a Tire pressure sensor fault-code? First, you should make sure that you have the right tire pressure in all your tires. Check your tire pressure with a tire pressure gauge. To find the correct pressure you should have in your tires, and you have to check the tire pressure label. You can often find the label on the body behind the driver door. You can also find it in your repair manual: You should always fill a bit more pressure than the label says if the tires are warm. The tire pressure can differ a lot depending on the temperature of the tire. If the label says, 220 kpa tire pressure the TPMS system will store it as an error code if it goes below this pressure. If you fill it to 220 kpa when the tires are hot, it may go down to 200 kpa when the tire is cold, and it will trigger the error code. In this case, it is better to fill a bit more than the label is telling you. After you have filled your tires with the correct pressure, you do often have to reset the system manually. Some cars do have a reset button and some cars you should drive for ~15 mins to get the light to go off. Check your repair manual of how to reset the TPMS system on your vehicle. If the fault still occurs, you have to read the error codes of the TPMS system to see what the trouble codes are. It could be a communication error with one of your tire pressure sensor or a damaged tire pressure sensor. Sometimes the sensors are losing the communication with the control unit, and you have to try to reprogram them with a TPMS activation tool that is compatible with your vehicle. Where is the tire pressure sensor located? The tire pressure sensors are typically installed inside the tires of the car. You can usually see it when you are looking at the tire air valve. When there is a tire pressure sensor installed you can often see a nut installed around the valve, but not in all cases. The only way to find out is to remove the tires from the rim, or call your authorized dealer and ask them. A lot of cars don’t use tire pressure sensors, they take the speed from the ABS sensors and calculate the rate of each tire and calculate the tire pressure. Normally BMW, Mercedes, VW, etc. Always fill a bit more tire pressure than the label says if your tires are not cold. If you have any other questions about the TPMS system or want to tell us about how you solved your problem, comment down below and I will answer as fast as possible. If you have any other car questions you want answers for, and you can ask us for free at our homepage. Tire pressure sensors have been replaced. After 17 miles dash light comes on, and says “tire pressure fault”. Turn key off, when engine restarts, the tire pressure light is off. Will come back on randomly after 17 miles. Have taken the vehicle and tire pressure sensors test good. Undercarriage is clean, tires are clean. Stored in a garage. This problem has been continuing for months, bordering years. It may be an intermittent problem with one sensor that is causing it to lose connection with the tire pressure control module. Impossible to say from here without some real testing, but I have seen this problem before.